Françoise Gilot considers her print work to be integral to her creative oeuvre. Gilots first experiments in printmaking were etchings made in 1935 at the age of fourteen with family friend and French post-impressionist artist, Jacques Beurdeley. None are extant. She learned aquatint etching in 1946 from the then retired Louis Fort, who had been a master printer for Picasso and publisher Ambrose Vollard. Only a few artists proofs were ever printed. Gilot began making original lithographs in 1951 at the Mourlot workshops in Paris under the paternal eye of Fernand Mourlot. Daniel-Henri Kahnweiler, then director of Galerie Louis Leiris, was the first to commission Gilot to create lithographs. In the early 1960s, Associated American Artists in New York, under the directorship of Sylvan Cole, commissioned six lithographs. All the editions sold out. In the 1970s Gilot was invited by June Wayne and Clinton Adams to make lithographs at the Tamarind Workshops in Los Angeles and Albuquerque. Also in the 1970s, through an association with Graphicenter in San Diego, California, Gilot developed a fresh enthusiasm for etching and created a number of complex aquatints. 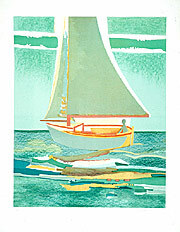 Many of her most recent color lithographs were printed at the Mourlot Workshops and Solo Press in New York. Always particular as to what constitutes an original print, Gilot prepares the stones or plates in her own hand; oversees the mixing of the inks, and supervises all phases of the printing. She utilizes a variety of techniques including lithographic crayon, tusche and washes to obtain the desired effects. What challenges Gilot in her print work is the manipulation of all elements  the plates, various techniques, transparent color, and the mise en page. The sample works illustrated here exemplify her creativity in original prints as well as echo in this medium the leitmotifs previously discussed. The catalogue raisonné of Gilots original prints, Stone Echoes, Original Prints by Françoise Gilot, by Mel Yoakum, Ph.D., was published in 1995 by the Philip and Muriel Berman Museum of Art at Ursinus College in Collegeville, Pennsylvania. In 1991, at Mourlot in Paris, Gilot created an ambitious color lithograph Navagateur Solitaire (Sailing Alone) using as many as nine colors of varying transparencies beautifully overlaid and interwoven through the applications of multiple washes and lithographic crayon textures. This original print is monumental in format and concept. The execution of Venetian Gondola in only five colors required the experience of a colorist, the three-dimensional vision of a sculptress, and the technical acumen of a master in lithography. In order for the paper itself to function as the light necessary to simulate the sparkle Gilot desired, she created a chopmark device on the zinc plates through a tedious masking process using gum Arabic. Registration of the five plates was critical. Once the initial color of turquoise was laid on the paper, the plate for the yellow ink had to partly transform the turquoise color to moss-like tones without blotching or muddling the glimmering quality Gilot wished to create. The third plate of red ink gave subtle warm tones  a glow to the distant architecture and, because of its transparency, enlivened the image in its union with the first two colors printed. A warm gray was carefully introduced to give sculptural definition and subtle undertones of shading. The final plate of ultramarine blue delineates areas of shadow and suggests the varying depths of the lagoon at dusk by orchestrating all the colors and permitting them to dance with each other on the surface of the paper, Gilot created  in concept execution and masterful printing  a tour de force lithograph, which shimmers as if illuminated from behind. 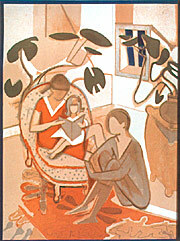 My Children in Brittany II is a charming portrait of Gilots three children, Claude, Paloma and Aurelia, realized through lush washes, subtle tonal harmonies and Gilots signature techniques for allowing the unprinted paper to create depth and define special planes within the composition. As throughout her oeuvre, Gilot has come to rely increasingly on color to create structure as a kind of antidote for the traditional devices of perspective. This can be most vividly seen in one of her lithographs from the early 1990s, In the Sun, a consummate Gilot original print  alive with color, dimensionality, surface tension, zestfulness and harmony  executed in only eight colors. 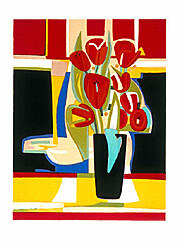 It is the combination of all the energy and expertise which Gilot brings to her printmaking that enables her to create a color lithograph where a central black vase of red tulips can remain suspended in a forward plane without succumbing to its chromatic and structural inclinations to merge with the adjacent background.